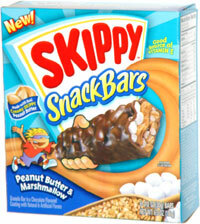 Taste test: Skippy has packed quite a few different things into these bars. There's a granola layer on the bottom, a peanut butter layer above that, then scattered small marshmallows above the peanut butter, and the whole thing is coated with chocolate. The marshmallows jut out of the top as visible bumps in the chocolate. It was awkward to bite into because while the marshmallows, chocolate and peanut butter were soft, the granola was much denser and chewier. The taste was OK but nothing great. It was kind of mishmash of all of the previously mentioned elements, with nothing except the peanut butter standing out as a distinguishable individual flavor. Smell test: Smells mostly peanut buttery, a little chocolatey.